Private Vault Storage Rentals Protect your valuables in Southern California’s most convenient maximum-security vault facilities. A secure storage unit at BlueVault is like having your own private Fort Knox. Your valuables can all be kept secure and private. Every BlueVault storage unit includes $5K of zero-deductible insurance, increasable at low cost. BlueVault is among the most secure vault facilities available serving private, professional, and commercial clients. If what you have is important, this is where you protect it. Choose from 11 vault storage sizes ranging from small safe deposit boxes up to units of 48 cubic feet. Larger units can be ordered to your needs. Your vault unit is nested within a 90-ton bunker made of hardened steel and concrete, wrapped in 9 layers of electronic security, and monitored around the clock by Siemens, the people who safeguard among the world’s most sensitive facilities. Every unit is insured for $5,000, but can be increased to multi-millon dollar coverage at very favorable rates – about 75% less than what it would cost if at an office or a home. This zero-deductible coverage is by A+ rated AXA, one of the largest carriers in the world. 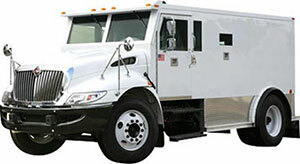 Contact us if your needs include armored service. BlueVault is not part of the U.S. banking system. Registering is simple. A valid US Drivers License (or equivalent) is required. You will get the only keys to your unit, and you may access your unit anytime during open hours. Upon entrance you will be electronically identified via multiple methods. You may work with your valuables in one of our privacy rooms. You may also schedule the use of our conference room to meet with family, attorneys, or clients. Rent a Vault Storage Unit online now at BlueVault San Diego or BlueVault Orange County. Or visit one of our locations and see for yourself. We’ll be happy to give you a tour and answer your questions.